System Theory. 2. Response Surfaces. 3. Basic Statistics. 4. One Experiment. 5. Two Experiments. 6. Hypothesis Testing. 7. The Variance-Covariance Matrix. 8. Three Experiments. 9. Analysis of Variance (ANOVA) for Linear Models. 10. An Example of Regression Analysis on Existing Data. 11. A Ten-Experiment Example. 12. Approximating a Region of a Multifactor Response Surface. 13. Confidence Intervals for Full Second-Order Polynomial Models. 14. Factorial-Based Designs. 15. Additional Multifactor Concepts and Experimental Designs. Appendix A. Matrix Algebra. Appendix B. Critical Values of t. Appendix C. Critical Values of F, &agr;=0.05. Subject Index. N.R. Draper reviewed the first edition in Publication of the International Statistical Institute "...discussion is careful, sensible, amicable, and modern and can be recommended for the intended readership." The scope of the first edition has been revised, enlarged and expanded. Approximately 30% of the text is new. 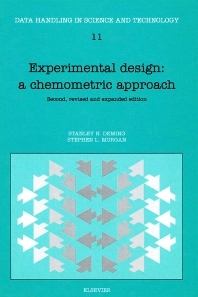 The book first introduces the reader to the fundamentals of experimental design. Systems theory, response surface concepts, and basic statistics serve as a basis for the further development of matrix least squares and hypothesis testing. The effects of different experimental designs and different models on the variance-covariance matrix and on the analysis of variance (ANOVA) are extensively discussed. Applications and advanced topics (such as confidence bands, rotatability, and confounding) complete the text. Numerous worked examples are presented. The clear and practical approach adopted by the authors makes the book applicable to a wide audience. It will appeal particularly to those with a practical need (scientists, engineers, managers, research workers) who have completed their formal education but who still need to know efficient ways of carrying out experiments. It will also be an ideal text for advanced undergraduate and graduate students following courses in chemometrics, data acquisition and treatment, and design of experiments.